Fall is the season for a walk in the woods. In the summer the trees are green, in the winter they're bare and in the spring it's nothing but buds. It's October when the forests become a palette of nature's boldest strokes; copper, gold, bronze, fiery yellows and crimson reds. [A Fall view from the Highbanks Trail] Virgin Pines Foot Trail: This is one of the finest walks in fall, a one-mile loop at Hartwick Pines State Park just north of Grayling and reached from I-75 via exit 259. Begin at the interesting the Michigan Forest Visitor Center (517-348-2537) to learn about Michigan’s amazing logging era and then head outside. The trail is best known for the 300-year-old white pines that tower above you. But in between are beech, sugar maples and other hardwoods whose brilliant fall colors illuminate the dark, ghostly trunks of the old growth pine. Along the trail you pass a re-constructed logging camp that was built in 1935, turn-of-the-century Big Wheels that lumberjacks used to transport the huge tress and serene Chapel in the Pines. 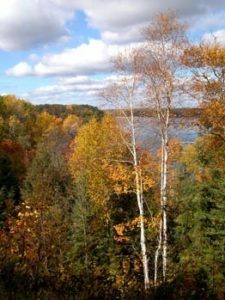 Highbanks Trail: More logging history and panoramic views can be enjoyed along this seven-mile linear trail that skirts the high bluffs above the Au Sable River in the Huron National Forest. A popular fall hike is to begin at the Lumberman's Monument Visitor Center roughly the midpoint of the trail, and hike to the west end for a round-trip of eight miles. Along the way you'll pass a handful of scenic vistas of the Au Sable River that in mid-October will be painted in vibrant fall colors. The west end of the trail is Iargo Springs, where a 300-step stairway leads you down through the trees to observation decks above the gurgling springs. From M-65, Lumberman's Monument (989-362-8961), is four miles east on River Road. Warren Woods Natural Area: This 200-acre tract in Berrien County preserves a stand of primeval beech and maple that burn in reds and oranges from late October to early November. Saved when shopkeeper Edward Warren purchase the forest in 1879, just seven years after the country created its first national park, the natural area is now part of Warren Dunes State Park (269-426-4013). The hike begins with a foot bridge across the Gailen River and then continues as an easy three-mile loop past the giant trees. From exit 6 of I-94 head east on Elm Valley Road 2.5 miles to the park entrance. Lighthouse Park: Another fine autumn walk is located at the tip of Old Mission Peninsula 20 miles north of Traverse City via M-37. Lighthouse Park has more than four miles of foot paths that begin at a historic lighthouse and then skirt the beaches and cobbled shoreline of Grand Traverse Bay before heading inland to wind through an impressive hardwood forest of oaks and maples. After an invigorating afternoon in the woods, head south five miles on M-37 to recuperate at Old Mission Tavern (231-223-7280). The country inn offers good food and a wide selection of microbrew beers and local wines. If there is a nip in the air, a fire will be crackling in the wood burning stove while the walls around you double as an art gallery. Escarpment Trail: True, Porcupine Mountains Wilderness State Park, Michigan’s largest, is a long drive for anybody starting south of the Mackinac Bridge. But this four-mile trail is stunning in the fall and well worth every hour you spend on the road crossing the Upper Peninsula. Located west of Silver City at the end of M-107, the Escarpment Trail provides almost continuous edge-of-the-cliff views of Lake of the Clouds and the Upper Carp River. Both are surrounded by mountain-like ridges forested in hardwoods that frame this amazing scene in the best hues of autumn. Call the park (906-885-5275) in advance as the colors here come early, usually at the end of September.